Restaurants in downtown Lawrence are not necessarily well known for their value. Rents are high on and around Massachusetts Street, so most food is overpriced, particularly based on the quality of said, which in this case is not necessarily a positive thing. I have tried several, including The Mad Greek, Teller's (now closed), Rudy's Pizza, La Parrilla, Cielito Lindo, La Familia, Fuzzy's Tacos, and Curry in a Hurry to name a few, and with the exception of the last two, have yet to find great food and true value ... UNTIL NOW! My wife had heard that Zen Zero was good and had I known it was a Thai restaurant, I would heave tried it sooner. 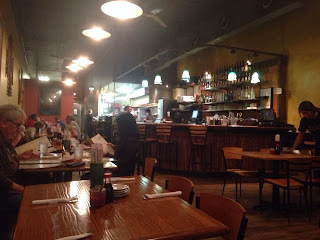 I love Thai, Vietnamese, and Korean cuisine thanks to their abundant use of exotic and flavorful spices, particularly curry, so when I heard Zen Zero was a Thai restaurant, I eagerly agreed to give it a try. The decor is modern, yet cozy with hints of zen influence in select pieces of art on the walls and construction with warm Earth-tone colors and an open kitchen emitting sounds, smells, and flames as chefs prepare meals in view of customers. The server arrived with a complimentary basket of Asian chips, light and crunchy, likely a rice-based starter, which are tasty but an accompanying sauce to dip in would be nice. There are soy sauce and an Asian-style chili sauce on the table, so you can easily make your own dipping condiment, but a creative and inexpensive accompaniment would be an added bonus. We arrived on Sunday night and draught beer was on special for $3.00 a (American) pint. Not a huge selection, a pale ale, a wheat, and a seasonal (Octoberfest, Irish Red), I ordered the Octoberfest (normally $4.00), but the server quickly told me they were out, so I went for the pale ale (normally $3.75). The App (appetizer) Sampler ($7.29) which came with two steamed veggie momos (a tasty Tibetan dumpling), two chicken satays (grilled chicken on a stick accompanied by peanut sauce) and two fried tofu triangles. It took quite a while for our appetizer to arrive considering the restaurant was only about half full, but I enjoyed a pint of pale ale ($2.50 - normally $3.75) while waiting. The appetizer was relatively small, arriving on a plate smaller than our dinner plates at home, and left me hungry for more. It would have been enough for one person, but there were two of us, so we each had one momo, one satay, and one tofu each. The momo (Himalayan dumplings with charred tomato and spicy sesame chutneys served steamed) would have been better fried, an option when ordering the momo appetizer, but not on our sampler platter, and was delicious, but it was consumed in just two bites (I could have easily handled it in just one). A steamed dumpling the size of a fortune cookie filled with veggies and served with sweet and sour sauce, momos are likely better deep fried. 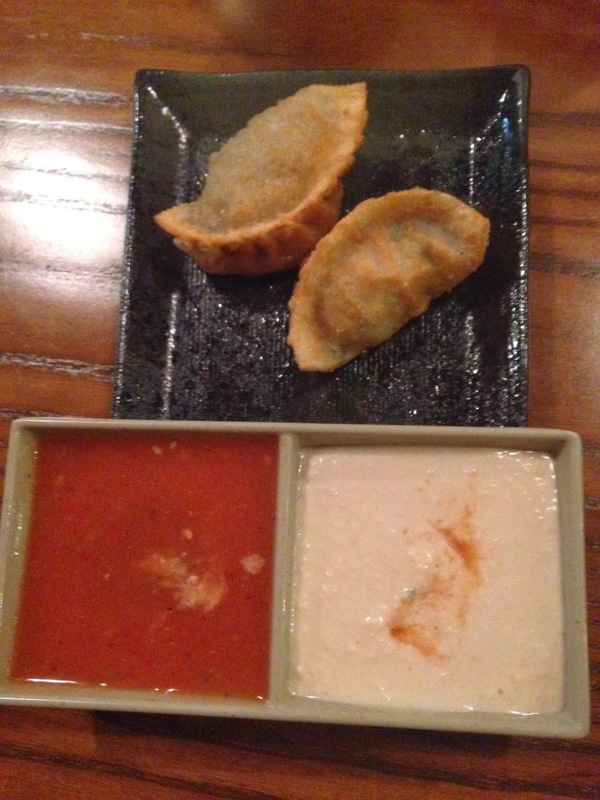 The Fried Pork Momos ($4.79) are much tastier and less healthy than the steamed variety, coming with four dumplings and two sauces, a mildly spicy red tomato chutney and an almost white sauce that reminded me of very well-blended hummus. The Fried Chicken Springrolls ($4.29) come with a sweet and spicy sauce infused with chili peppers, but for the price I would expect more than two, both of which were consumed post haste. They were savory and crunchy, containing cabbage, bean sprouts, and a few other unknown vegetables, and, beside the small portion, they were also excellent. My wife ordered a vegetarian dish, Phad Phak Ruam Mitr ($7.29), a mixed vegetable stir-fry with broccoli, onions, garlic, carrots, bell peppers, snow peas, Napa cabbage, scallions, baby corn and tofu and served with Jasmine rice. It was light and delicious, not too spicy for an Italian not used to eating hot and spicy foods (penne arribiatta is as hot as it gets in Italian cuisine). The vegetables were fresh and crisp, and the sauce light yet complex enough to satiate the palate. I absolutely love curry and Zen Zero's Massaman curry ($7.69), a coconut curry from Southern Thailand with potatoes peanuts (Sorry NO Pork Option with this Curry), was THE BOMB! Having ordered mine with the customary beef, the curry was scrumptiously rich and perfectly seasoned. A thick red curry, Massaman comes with tofu or meat (other than pork) and potatoes and peanuts in a huge bowl served with Jasmine rice. 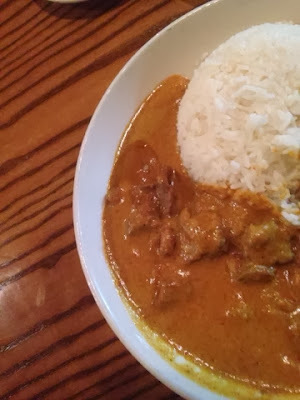 Not abundant in the beef department, I was not disappointed because the thick curry sauce was probably the second best I have ever eaten (the best was at a small Vietnamese restaurant in Palos Verdes, California back in the late 1970s) ... SUPERB! On our next visit I wanted to try the Green Thai Curry ($7.69 - green curry with bell peppers, eggplant, and bamboo shoots), but I hate bamboo shoots because they have the consistency of Styrofoam and zero taste, so I asked the server (Zana) if I could substitute potatoes. Yellow and green Thai curries are excellent and normally are served with chicken, pork, or beef (chicken is the norm) with potato and peas, so I was dismayed when I saw bamboo shoots as an ingredient. Bamboo shoots and water chestnuts, another dreaded ingredient, are usually found in Chinese cuisine, not Thai, so I thought potatoes would be a rather benign request. I was told that there would be a $1.00 up-charge for substituting potato for bamboo shoots! Considering the fact that potatoes are one of the cheapest staples in the produce department and much more pricey than an equal weight in potatoes, I declined and simply asked for the dish minus the water chestnuts and plus beef ($2.69 extra). The green curry was delicious, spicy enough for the pallet but not too much for my acid reflux. The bell peppers (red and green) were a bit too crunchy (raw) for my taste, but the dish was excellent. The "Jasmine" rice, which accompanies most dishes, seems to be merely white rice because I could neither taste nor see any hints of Jasmine. The beef, which I paid nearly $3.00 extra for, consisted of 3 or 4 pieces of thinly sliced beef and 1-2 inches in length, nearly non-existent. If there had been MORE MEAT, the dish would have been perfect, beside the fact that a couple of chunks of potato would have also been nice! The Phad Thai ($7.29), a classic Thai stir-fry with rice noodles, eggs, bean sprouts, scallions, cilantro and peanuts in a mild red curry sauce, was robust and delicious. Looking much like an Italian pasta dish, it had nothing else in common with Italian cuisine other than the noodles, and was perfectly seasoned. 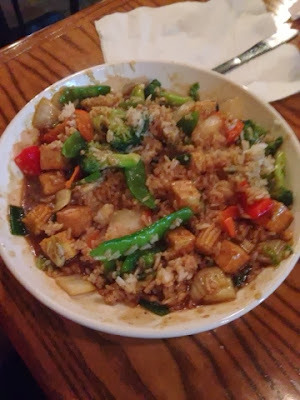 The vegetables were well cooked and not raw, the dish was sprinkled with small chunks of peanuts and stir-fried in a mild red curry sauce, for a vegetarian dish it was scrump-diddly-umptious! The Dry Chicken Curry Thakali-style ($8.99) is a traditional Nepalese curry made with onions, ginger, garlic, garam masala and tomato, served with jasmine rice, rahar ko dal (yellow lentils) and potato achar. The achar sat atop the dish and was oddly cold, so I asked the server if that was the intention and it was, looking and tasting like Nepalese potato salad. With quite a few chicken chunks throughout, the dish was my least favorite of all my meals so far, somewhat boring with a bit of bite and too much jasmine rice for the amount of sauce. Zen Zero has become a staple in our house and we will be returning frequently in the future, so expect updates to this review as I try the red, yellow, and "dry" curries, among other dishes, in upcoming months. Good restaurants are not abundant in Lawrence, particularly downtown, but Zen Zero is a welcome addition! CombatCritic gives Zen Zero 8 OUT OF 10 BOMBS (room to grow) ... Bombs are good!